CM Magazine: How Does the Canadian Government Work? (Your Guide to Government). ISBN 978-0-7787-0908-4 (pbk. ), ISBN 978-0-7787-0903-9 (RLB.). In 1952, Elizabeth II became queen of the United Kingdom of Great Britain and Northern Ireland. By becoming queen, she also became Canada's head of state. The constitution gives the head of state the power to govern. In many other countries, the head of state governs the nation. But in Canada, the prime minister is the head of government. I so wanted to like this book but I was so disappointed. The inconsistent quality of both the text and the pictures prevents me from recommending How Does Canadian Government Work?. How Does Canadian Government Work? is part of the series, "Your Guide to Government", which provides a simplified overview of United States government. I was very pleased to see that Crabtree had decided to dedicate a whole book to Canadian government in this series. The authors have attempted to simplify a very complex subject to make the information accessible to young students. Unfortunately, they have not been up to the task. The chapter titled "Parliament" attempts to explain the concept of what a parliament is by giving examples of parliaments around the world. The second paragraph refers to Canada's parliament specifically. The paragraph begins: "Canada's Parliament is based on the British system of government" and goes on to briefly explain the difference between our head of state, the Queen, and the head of government, the prime minister, premier, or first minister. The next paragraphs, however, switch back to references to parliaments in general without an appropriate indicator to young readers (and older readers like me also) that we are again talking about parliaments around the world. Chambers are also called houses. Bicameral parliaments include an upper house and a lower house. In some parliaments, the people elect both houses. In others, they elect members of only one house. The prime minister chooses members of the other house. Also, more careful consideration could have been given to the place where this chapter appears in the book. The information in the book seems accurate, and necessarily simplified, but young readers and researchers need to have information presented in an order that builds. Beginning with a chapter about the concept of government, followed by a chapter about the concept of parliament, before moving to the specific topics about Canadian government would have been more logical in terms of building understanding. Instead, the book begins with a chapter about the concept of government in general, then moves to a chapter about specifics about government in Canada, back to a chapter about the concept of parliament, and then on to a chapter about Canada's history. Other chapters, follow in a more logical sequence: "How Parliament Works", "The Head of State", "The Prime Minister, The House of Commons, The Senate, Provincial and Territorial, Aboriginal Governments", "Local Governments", "Other Parliaments", "Discussion Questions", and "Learning More", "Glossary" and "Index". Many of the pictures are colourful and appropriate to the text, although not always flattering to the people pictured, or to the government. In the picture accompanying the chapter, "The Head of State", the governor-general has been caught with his mouth puckered while his wife appears to be asleep at the opening of parliament. More problematic for teachers working with junior students is the picture on page 21 of the Speaker of the Senate appearing to give either the photographer or the visitor with him the finger. Maybe this book will turn out to be more widely circulated than you might expect. Who chose these pictures? At the back of the book, "Learning More" is a list of three books and two websites for further study. 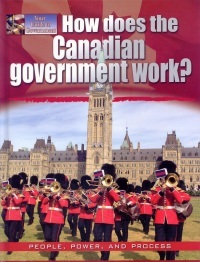 It is good to know that there are other books on this topic worth investigating before you spend money on How Does Canadian Government Work?. Internet links are always changing, but that doesn't excuse the inclusion of a link that cannot easily be input from a standard computer keyboard. Even after searching the 'symbols' in my word processing program, I can't find one of the characters used. Given that junior students may all be more computer savvy than I am, maybe it isn't a problem, but it isn't necessary. There are wonderful resources available about Canada's political system at the Citizenship and Immigration site � settlement.org. The rest of the details of the link are unhelpful and more likely to change. It would have been better to only include the main site URL. "Glossary" is brief, especially given the uniqueness of some of the vocabulary. An entry for specific government related words, like "riding", would have been helpful but are not included. Instead, one of the 12 entries in the glossary is "manage to control or direct." How Does Canadian Government Work? is to be commended for including a chapter on Aboriginal governments, a topic frequently omitted from the topic of Canadian government. Unfortunately, it is not enough to make me recommend this book. Better picture choices, the inclusion of some organizational charts and maps to clarify the locations of the governments being referred to, better website links, and better organization, would all improve this book.